August 03, 1999, L. G. Crabo. 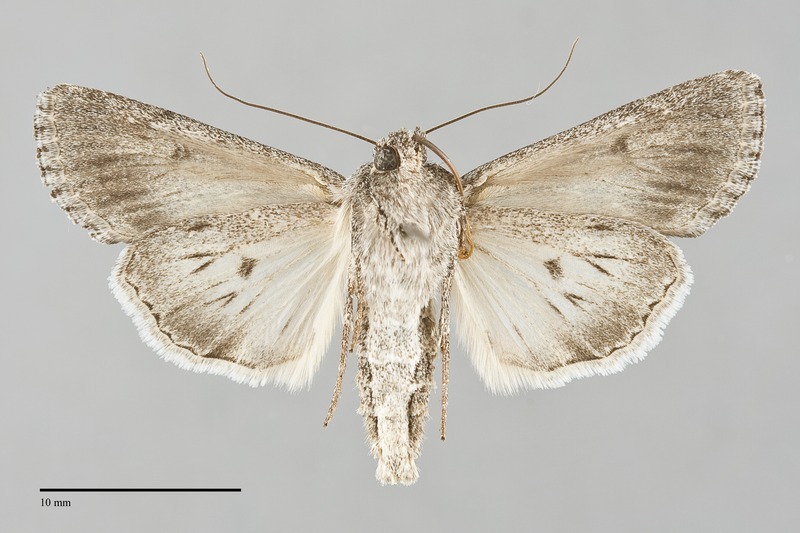 Sympistis major is a medium-sized moth (FW length 15 - 18 mm) variable streaked gray moth with a fused orbicular and reniform spots and a pale hindwing with a margin that flies in dry forests east of the Cascade and Coast Ranges in the summer. The color and pattern of the forewing is variable. The color ranges from blue-gray to brown-gray, usually slightly lighter on the posterior wing and darker toward the margin and sometimes lighter in the posteromedial subterminal area. The color tends to be darker and the pattern less prominent in females. All elements of the pattern are variable. A thin black basal dash is often present. The basal line is absent. The antemedial, median, and postmedial lines are usually limited to similar oblique gray marks on the costa but can be completely absent. The gray postmedial line is usually visible to the top of the cell, rarely further posteriorly. The subterminal line is pale gray, often slightly yellow, evident as irregular spots between the veins and gradually increasing in thickness from anterior to posterior. It is variably preceded and followed by long black lines. The terminal line is light to dark gray. The fringe is dark gray, solid or weakly checkered. The spots can be present or absent. When present they have thin dark gray outer and light gray inner outlines and are filled with the ground color. The orbicular spot is elongate oval or diamond-shaped, touching or fused to the medial reniform spot. The reniform spot is strongly kidney-shaped. The claviform spot is long, reaching over half-way to the postmedial line. 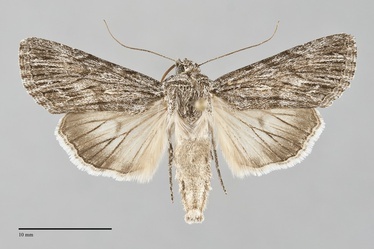 The hindwing ground color is also variable, light gray to darker brown-gray, generally lighter in males than in females, darker toward the margin but rarely forming a dark band. The veins and terminal line are dark gray. The hindwing fringe is tricolored with a yellow and dark gray inner line and white to gray edge. The head and posterior thorax are dark gray. The collar is banded with transverse dark and light gray. The male antenna is filiform. 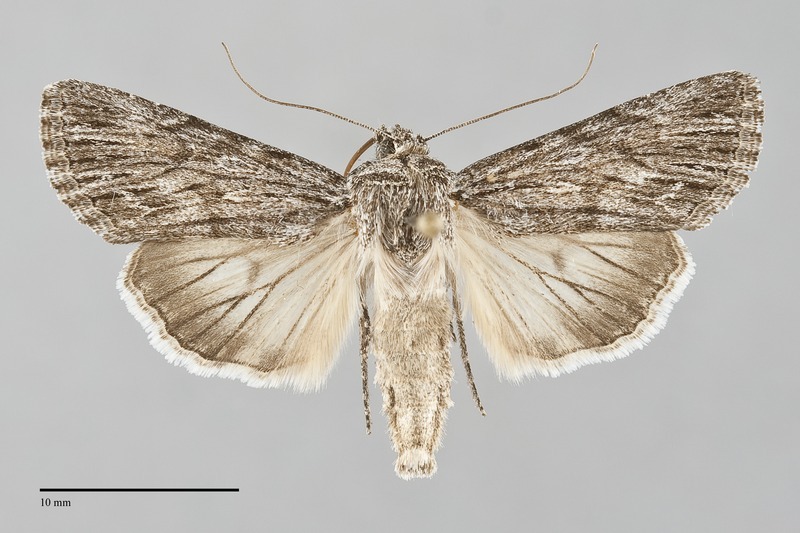 The most similar species in our region is Sympistis poliochroa, a heavily streaked darker gray moth that usually flies later in the summer at most locations where these species are sympatric. Its postmedial line is visible across the width of the wing, and the black marks between the veins on the distal wing are much more prominent that in S. major. It has a lighter hindwing with a well-defined black marginal band unlike that of S. major. 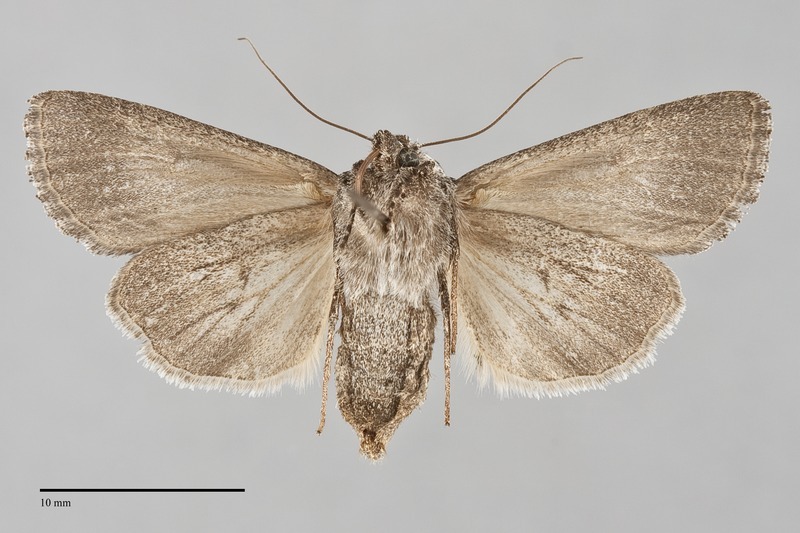 Catabena lineolata is included as a similar species because it has a streaked wing, but it is much smaller and lighter gray than S. major. The variation in this species within and between populations is interesting and has resulted in differing opinions on how many species are involved. This situation is further complicated by the presence of several mitochondrial DNA haplotypes in these populations. Troubridge and Crabo (1998) separated the western taxon Sympistis major from eastern Sympistis riparia (at that time both placed in the genus Oncocnemis), previously considered to be subspecies of S. riparia. 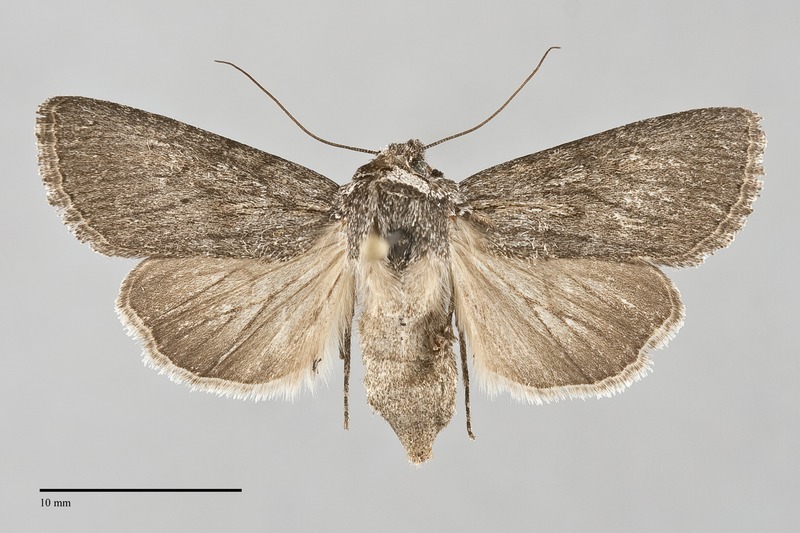 Troubridge (2008) went further, describing two additional species, Sympistis chons and Sympistis amun from the same type locality in the Northwest - Canada, British Columbia, Kirby Flats Rd., 50° 32' N 121° 43' W. We favor a conservative interpretation that there is no more than a single species, Sympistis major, in our area. In all likelihood the most realistic interpretation is that S. major is no more than a western subspecies of S. riparia since there appears to be a cline across the Canadian Prairie Provinces. This species is widely distributed in drier habitats throughout much of western North America. In the Pacific Northwest, it is moderately common in open ponderosa pine forests and juniper woodlands east of the Cascades. It is found uncommonly on ridgetops unlike many other Sympistis species in our area. Sympistis major is widely distributed in our area. It occurs as far north as the Peace River in northeastern British Columbia and also occurs in the central and southern parts of the province. The range extends south through Washington, Idaho, and Oregon east of the Cascade divide. It is absent from xeric steppe habitats in the central portion of our interior basins. This species is widely distributed in the American West, occurring south through California and the Intermountain region. It also occurs in the western Great Plains and Rocky Mountain region, at least as far south as Colorado, southern Arizona, and the Texas Panhandle. Sympistis riparia is found further east, reaching the Atlantic via the Prairie Provinces, upper Midwest, and southeastern Canada. Adults fly during the summer, with Northwest records from late May to August with a peak in late June and early July. It is nocturnal and comes to lights.